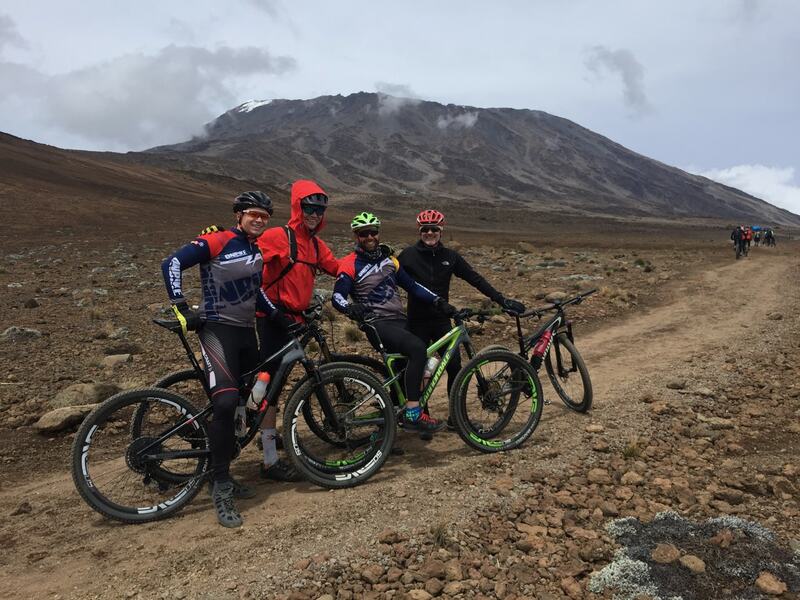 Kilimanjaro Mountain bike Expedition. Combining the best of hiking and biking. The opportunity to combine the best of trekking and mountain biking in one rewarding and possibly a life changing experience. Be part of an expedition team lead by qualified and experienced guides with multiple successful summits under their belt. Hike and bike through seven geological zones from the lush rain forest to the alpine desert environments. 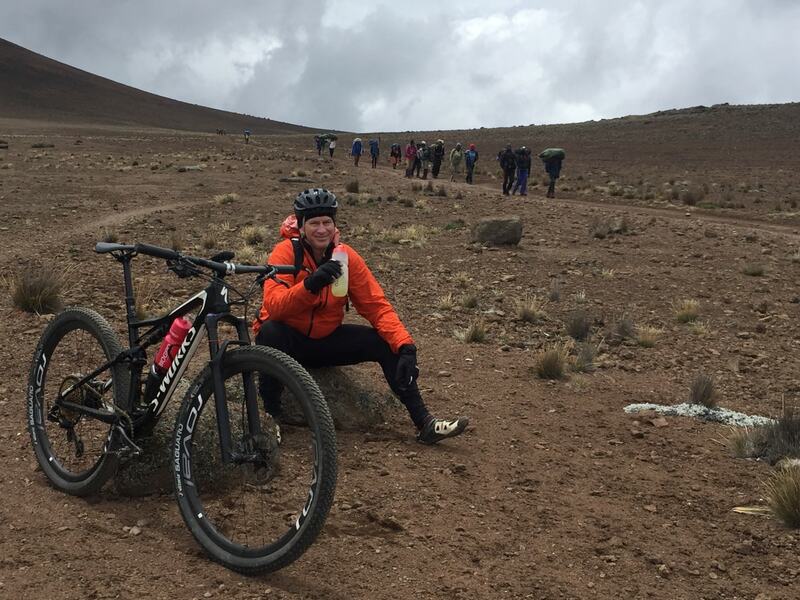 Trek & ride to the summit of Mt Kilimanjaro and downhill into the African plains. You might ask yourself: “Now who owns a bike and would not want to do this?” We add a further adventurous twist to this expedition. After your shot at lifetime bragging rights and descending 4095m, it’s time to rest our bones as we transfer to a private game lodge & ranch. We add a big cherry on top at the end of our itinerary with an African mountain bike safari, accompanied by a wildlife ranger. We know and love Kilimanjaro! With 20 years experience on Kilimanjaro and multiple successful summits in our arsenal, we are very confident in our ability to give you the best possible experience and support on the mountain. Mt Kilimanjaro 5895m AMSL is one of the seven summits, the highest mountain on the African continent and the highest free standing mountain in the world. Situated in Tanzania next to the Kenyan border she towers with the African plains at her feet. This beautiful dormant volcano is located 330km south of the equator, not far from the Indian ocean. After arrival at Kilimanjaro airport we take a 40min transfer to our hotel situated just outside the town of Moshi, located on the lower slopes of Mt Kilimanjaro. We meet the team and go over the last trip details and prepare our bikes and gear equipment for the adventure ahead. After breakfast at the hotel its time to load up and head for the mountain. A 45min drive to Marangu village takes us in to the Tanzania National Park at the parks main entrance Marangu gate. Here we need to sign in to the park, collect our permits an transfer to Kilema gate, the starting point of our route up Mt Kilimanjaro. The steep jeep track starts in the mountain forrest and has sections with loose gravel and larger rocks. Riders with good fitness and moderate technical skills will be able to ride all of the track leading us to Horombu hut. We turn, take care on the downhill and stop at Kilema camp for the night about 700 – 800 meters down from our highest point reached for the day. We start the day by repeating the last 7 – 8 km of yesterday’s ascend back up to Horombu hut. After lunch and a short rest at camp it’s time to break out the hiking boots. A short afternoon hike takes us to the beautiful and strange Zebra rock formation. Peaking over the ridge line we see our first views of Kibo peak in the distance. We hike down to camp for some tea and pop corn and our 1st night in the A-frame huts. We use today to further acclimatise to the higher altitude. We start our day with a short hike out of Horombu camp to get past an unridable section on the mountain. We will meet our porters further up trail from where we continue with a ride onto the saddle between Mawenzi and Kibo peaks at an altitude of around 4600m. 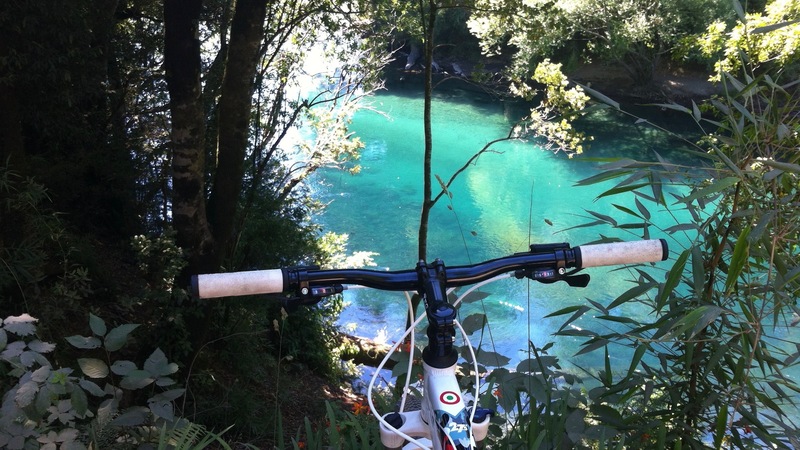 Spending good time up here and enjoying the excellent riding conditions is beneficial for our acclimatisation process. 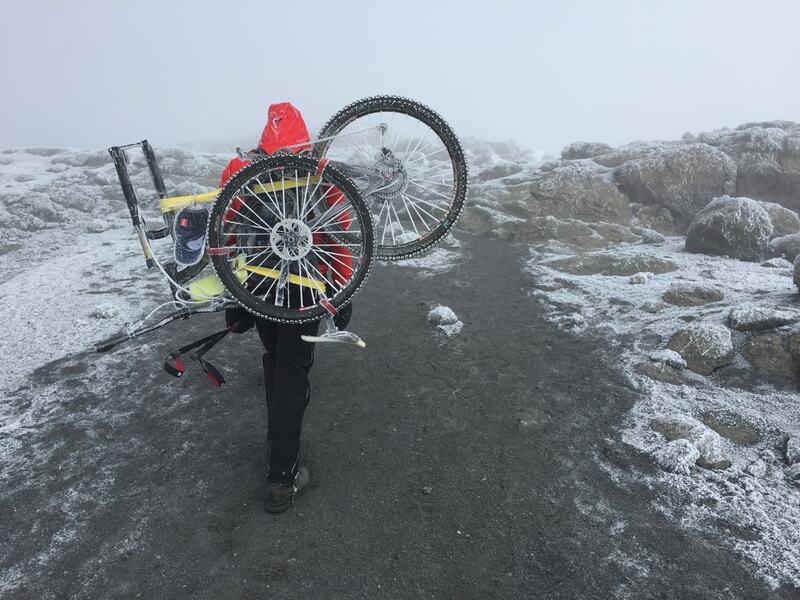 At these altitudes cycling is strenuous and higher winds is often experienced on the saddle. We set off on an early start again to our basecamp. Riding through alpine desert environment, we traverse the saddle once more with Mawenzi at our backs and Kibo ahead of us. On a clear day in the distance one can see the route up the steep mountain face leading towards Uhuru, the summit of Mt Kilimanjaro, our ultimate goal. Taking it easy and reaching basecamp fresh is vital in setting one self up for summit success. After reaching our basecamp we have an early dinner, rest and replenish before our summit attempt. The Big Day! We start our summit bid at midnight, shortly after some hot tea and biscuits to warm us up for the Kili shuffle. The route from Kibo Hut to Gilman’s Point is unridable. 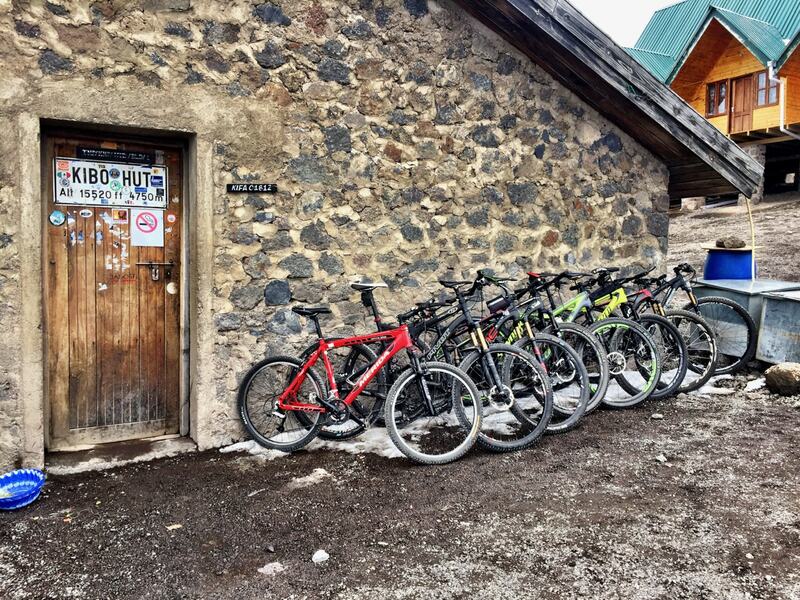 Our amazing team of porters will assist us with our mountain bikes during our summit night. 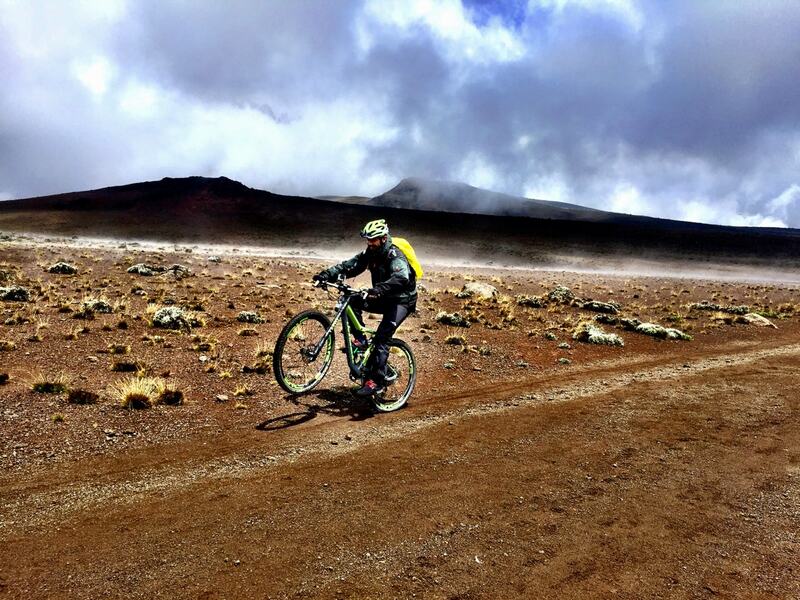 The first crater rim ride opportunity presents itself from Stella Point to Uhuru Peak. Reaching the top of Africa is a very special occasion, soak it all in! Cycling at this altitude is very challenging and should not be underestimated. Riders should pace themselves and ride well within their ability at this altitude and extreme conditions. Weather and health conditions will determine our time at the summit before we start our descend. The sweet victory ride down from Uhuru Peak to Stella point is short, but o so sweet. From here it is hike a bike stuff down with the assistance from your porter to about 1 – 2 km before Kibo Hut. Reaching camp we will take rest, refuel and prepare for the ultimate downhill. Then it’s bike time. We’ll send a 3945m descend to Kilema gate situated at 1950m. Along the way we will regroup and stop for some scheduled breaks and lunch. Reaching Kilema gate, we load the bikes and transfer to Marangu gate to sign out of the park and collect our certificates. From here we continue to the game lodge where we enjoy dinner, kick back and enjoy a well deserved rest. With a full day to enjoy at the lodge we continue our adventure shortly after breakfast. 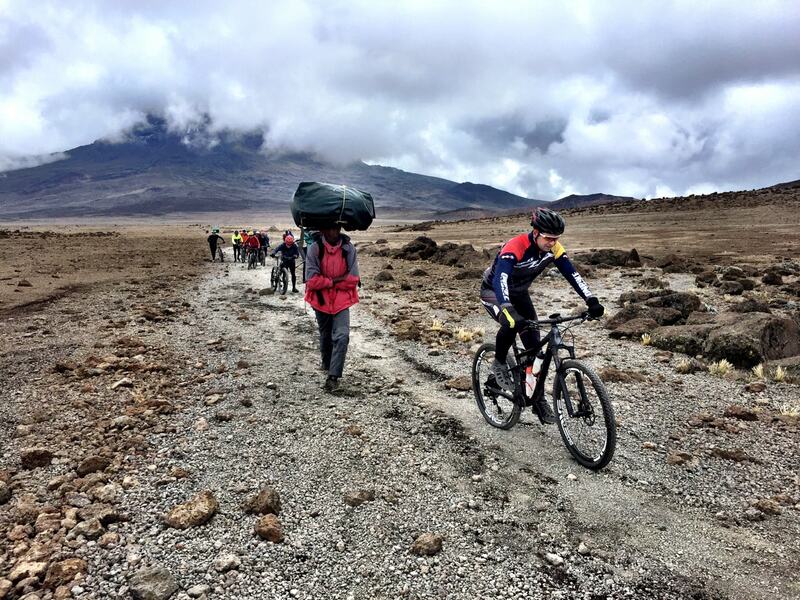 We’re back on the bikes for a African mountain bike safari through the Tanzania Savannah. Looking for wildlife guided by our wildlife ranger there is no better way to take in this unique experience. You have trekked to the summit of Kilimanjaro, rode your bike from the roof of Africa through the plains of Tanzania and amongst it’s wildlife. You have made memories and friends, but all good things come to an end . . . until the next adventure! Transfers to the hotel and departure from Kilimanjaro Airport. 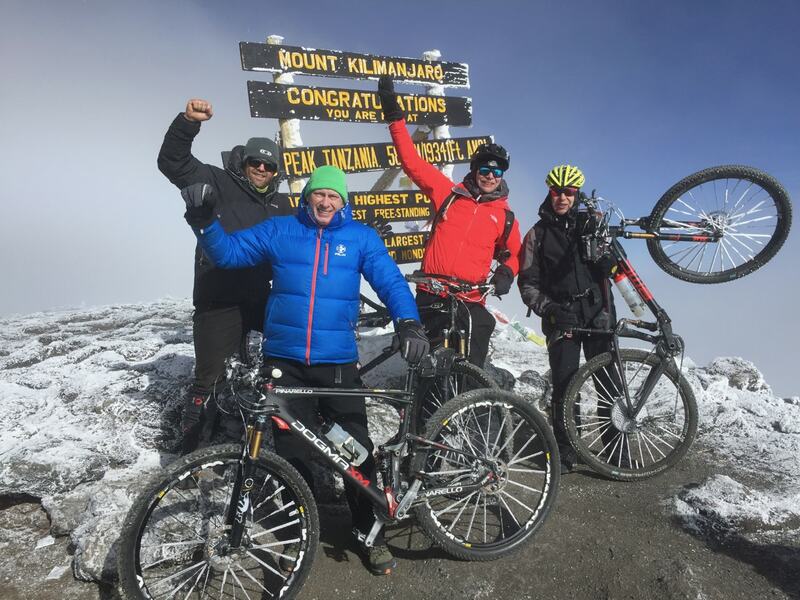 8 days / 7 nights guided & supported Mt Kilimanjaro Hike & Bike expedition. 1 Night hotel accommodation in Moshi. 2 Nights luxury tented accommodation at private game lodge, full board. All meals as indicated on the itinerary (from dinner day 1 to breakfast on day 8. Onbike MTB apparel to the value of $120. Professional wildlife ranger on mountain bike safari ride. Full expedition team, guides and porters. Alcoholic / Non alcoholic beverages.